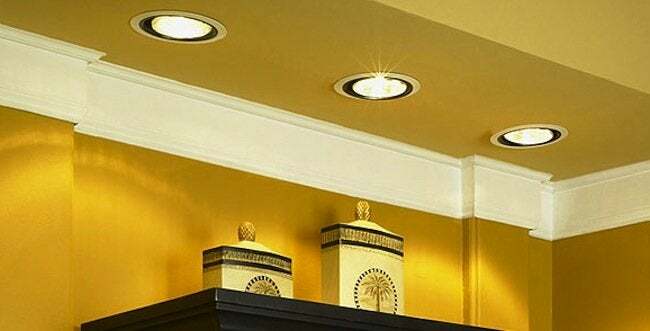 For understated room lighting around the house, consider the space-saving convenience of recessed high hats. Choosing the best lighting can be a bit of a challenge. Some rooms need cozy, subdued lighting to create ambience; others need high-wattage task lights to allow you to get the job done. But if what you need is overall room lighting that takes up barely any space at all, there’s nothing like a high hat. High hats are recessed lights—often called can lights—that are flush with the finished ceiling (the fixture itself is up inside the joists). High hats are terrific for illuminating large areas, where you need lots of light, such as kitchens, offices, and basements. They’re also great in hallways, where you need strong light for safe passage, but there’s not a lot of room for a hanging fixture or floor lamps. Today’s high hats aren’t the simple industrial-looking can lights of yesteryear. You can find stylish models with a wide variety of trim kits to get just the look you want, including “eyebrow” styles that can help direct some of that overhead light in a specific direction. Remember, if you’re installing high hats in a ceiling that is or will be insulated, choose fixtures that are insulation-rated, meaning that you can install insulation right up against them. High hats going into shower stalls or over bathtubs should have a shower trim, which has a gasket that keeps moisture out of the fixture.